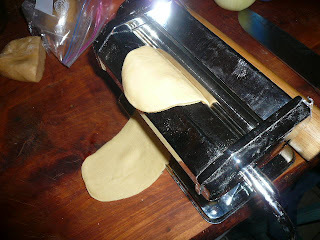 I've posted fettucine and linguine and lasagne and ravioli but I've never posted about making pasta fresh at home. For the most part, it's fun and easy. However, it's time consuming, so I only really do it to make special meals. But I can't really recommend doing it if I don't prove that I can, right? I've heard of recipes with more yolks, different ratios, but I think that's the best way to start the challenge of doing this, and the $15 machine is just a must. 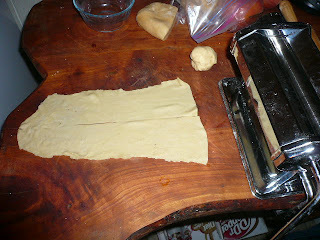 Pasta dough is so thick it's very difficult to roll it thin enough single-handedly. Or double-handedly. Also, several chefs and recipes stir this by hand, but it's messy enough without mixing the two stickiest ingredients in your pantry right on your counter. I plop it all in the food processors and whiirrrrr till a smooth ball of dough is knockin' around in there. Now, this is the most important step: go have a beer (or glass of wine). Ignore the pasta like a bad puppy for atleast 30 minutes. This lets the gluten build up so it will not tear when you roll it out. If you don't know or care about gluten, just trust me and drink your juice. After one or two glasses, go back and start the rolling process. you'll want flour on hand to sprinkle it and prevent stickiness. Start with a ball of pasta that fits in the palm of your hand, and smush it as flat as possible before rolling it through the widest setting on the pasta machine. Then re-roll it thru at successively smaller settings till you get to the lowest. What you have now is lasagne. 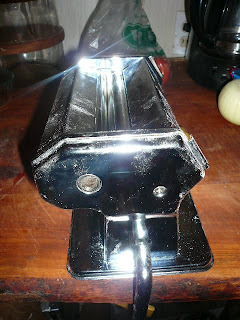 If your machine has adapter for fettucine or linguine or spaghetti, you would run it through those again to yield consistently-sized threads of pasta. But if your plan is lasagne, like my next post, then start layering your yummy goodness.